Justin Marozzi’s latest book, published by Allen Lane in the UK and Da Capo in the US, is Baghdad: City of Peace, City of Blood. For much of its extraordinary life Baghdad, the ‘City of Peace’ as it has been called almost since its foundation, has been one of the most violent cities on earth. As U.S. troops entered in 2003, they became the latest participants in a turbulent history stretching back to the year 762, when Caliph Mansur’s masons laid the first sun-baked bricks of his imperial capital. For 500 years Baghdad was the seat of the Abbasid Empire, a marvel of glittering palaces, magnificent mosques, Islamic colleges and teeming markets watered by the Tigris. This was the city of the mathematician Al Khwarizmi, who invented algebra; of Harun al Rashid, the caliph immortalised in many tales of Baghdad from A Thousand and One Nights; of the great poet Abu Nuwas, whose playful verses scandalised society, and of dozens of other astronomers, doctors, musicians and explorers. A thriving trading emporium and metropolis that attracted merchants from Central Asia to the Atlantic, its economy was the envy of West and East alike. Baghdad has been a city, too, of terrible hardships. It has been regularly beset by epidemics, famines and floods, by the terror of foreign invasions, military occupations and the brutal rule of strongmen, from capricious caliphs to Saddam Hussein. This, therefore, is also the history of those who have ruled Baghdad, and of those who have conquered it: Ottoman sultans, Persian shahs, the Mongol Hulagu, grandson of Genghis Khan, and of Tamerlane, Marlowe’s ‘Scourge of God’, who in 1400 sacked the city and ordered the construction of 120 towers from 90,000 of his adversaries’ severed heads. Baghdad: City of Peace, City of Blood equally tells the compelling stories of the long-suffering masses, the ordinary men and women from slaves to soldiers who have lived and died in this turbulent city. In this vivid new history of Baghdad – the first published in English in nearly a century – Justin Marozzi brings to life its whole tumultuous history, charting a captivating course through thirteen centuries of splendour and destruction. The history of Baghdad more than any other city mirrors the ebb and flow that has marked Arab history and civilisation. Justin Marozzi’s book is a brilliant, evocative and erudite retelling of the history of this most intriguing of cities. The author has drawn on a wide variety of sources, from travellers’ memoirs and diplomatic despatches to the works of the great medieval historians, geographers and theologians, many of whom were resident in Baghdad. To these important sources he has added his own experience of sojourns there over the last decade, giving the book an intimacy and authority often lacking in similar works. He knows whereof he speaks, having trudged the streets and visited the monuments and landmarks even where they have been reduced to rubble. BAGHDAD: CITY OF PEACE, CITY OF BLOOD is a work of love, and a homage to a place that has somehow survived the depredations of its conquerors, the fractiousness of its population and the duplicity of its rulers. Adventurous, sophisticated, respectful… a truly splendid work of erudition, storytelling and humanity… It is hard to imagine anyone else being able to write a book that does the subject such justice. Can there be any other major city in the world where legend and historic reputation are so different from gritty reality? . . . This paradox lies at the heart of Justin Marozzi’s new book. Abbasid civilisation produced great writing, science and history, but the city was made of mud, plaster and wood, and its walls and floors were covered with exquisite textiles. Almost nothing of this has survived. So we are left with the written sources to create a virtual city in our imaginations. Marozzi has achieved this in a lively and fascinating book, a “biography” of the city that can be compared with Simon Sebag Montefiore’s recent “biography” of Jerusalem. Marozzi’s writing is vivid and compelling and his historical judgements convincing and well founded in a wide variety of original sources… Baghdad is the best account we have in English of the long story of the development and survival of this remarkable city. A tremendous narrative history . . . His book is a great achievement: brave (he has lived in the Iraqi capital for ten years), densely researched, authoritative, vivid – and, it should be said, not for those who like a happy ending . . . The history of the “city of peace”, as Marozzi concludes, seems so often to have been written in blood; yet Baghdad still has pride, and, above all, “endurance”. Perhaps, one day, peace will come again. Justin Marozzi, the author of this splendid new history of the city, has shown more staying power than his waspish predecessor [Robert Byron in the 1920s]. He would be a Baghdadi flaneur if the security situation let him – as it is, visits to points of interest are made in body armour. Marozzi has lingered long enough in the city since the 2003 invasion (working on health and education projects) to rally from the near-total absence of a built heritage. He has got to know Baghdad by learning the language, forming friendships and reading the Arab historians of the past . . . Marozzi gets to the unchanging soul of his city through diversions from the main historical narrative into more recent life. This history of Baghdad by Justin Marozzi combines deceptively easy grasp of complex scholarship (much of it in Arabic) with astute observatuions made while working in Baghdad after the 2003 coalition invasion . . . The unwritten next chapter may be of an ethnically cleansed Baghdad as the capital of a rump Shia Iraq, shorn of its Sunni west and the Kurdish north. Either way, the bravely intrepid Marozzi, one hopes in his Kevlar vest, will be just the man to chronicle it. This account of Baghdad reaches another level as the story gets closer to our own time. His first hand observations with people in the street and in power must have provided more than enough material to write an entire book about this period. What is here is condensed, intense and fascinating. The description of the assassination of the Iraqi monarchy in 1958 is convincing, and vivid, as are details of the reign of terror that Saddam inflicted on his country . . . Arriving at the end of this long story of sublime beauty and unimaginable horror, of generosity and greed, of grandeur and pettiness, peace and blood, the events of the past couple of decades since Saddam’s invasion of Kuwait seem all the more comprehensible. Did Saddam Hussein embody Baghdadis, rather than just repress them? Justin Marozzi’s epic history of Baghdad, subtitled “City of Peace, City of Blood”, both reinforces this sense and gives good reasons to see beyond it . . . In between the slayings and sackings, Baghdad also gained a reputation as one of the most cultured places known to history. Its storytellers, scientists, artists and scholars, perched at the crossroads of Eurasia, left marks as deep as those of the cruellest rulers . . . Mr Marozzi plunges into the modern city, dangers and all, to visit tombs and charnel grounds and to interview current residents, including Ahmed Chalabi, the man who egged the Americans on to invade in 2003 and then turned on them with a guile that would have been familiar to his forebears. Justin Marozzi’s BAGHDAD is a richly researched chronicle of a city that was once the learned capital of the world, but whose dizzying apex gave way to a long and miserably bloody decline . 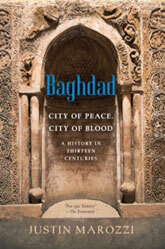 . . Baghdad’s history is not a happy one, but it is fabulous and ghastly and fascinating. Justin Marozzi is right in believing that the history of this most extraordinary of cities deserves retelling from the beginning when it was founded by Caliph Mansur on a bend in the Tigris river. As the capital of the Abbasid empire stretching from Morocco to Central Asia, he boasted that his newly built round city would be “the cross-roads of the universe” and so, for several centuries, it could claim to be. But as Marozzi shows in his fascinating and intelligent study of the city, Baghdad’s position at the cross-roads of the world proved to be a highly dangerous location. A rare book, an exceptional masterpiece. Justin Marozzi’s superb history of Baghdad is fully alive to the nuances of his story. 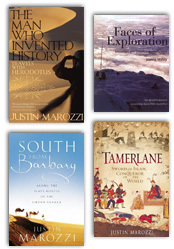 Marozzi is a fine travel writer who has also written a biography of the Mongol tyrant Tamerlane. Here he interweaves testimony from Baghdadis and written sources to create a gripping account. [An] epic biography of the Iraqi capital. Marozzi, a travel writer and historian, proves to be a skilled and generous navigator as he leads us through Baghdad’s 1,300-year history, collecting pace when needed, pausing to indulge detail and moment when required. It is like being taken around a museum by a wise and amusing guide… Marozzi feasts his reader in every sumptuous detail of Baghdad’s incarnation as the City of Peace during this era, from the ruby-red wine of Shiraz drunk from crystal goblets, to the finery of Harun’s harem and its 200 concubines…It is difficult, reading such an impeccably researched work at a time when the Islamic militants have poured from the desert to seize Mosul and sweep southwards towards Baghdad, not to find some trace of credibility in Tony Blair’s recent denials that the invasion of 2003 precipitated Iraq’s current crisis. In Marozzi’s pages rolling heads, paralysed rulers, sectarian strife and a desert in tumult seem traditionally as much part of Baghdad’s landscape as sandstorms and palm trees. With violence such an integral part of the city’s nature, it would be easy for an author to become repetitive or formulaic in describing its details. Repeated murder and massacre are no easy subjects. Marozzi avoids miring his reader in gore, however, and instead qualifies the inhumanity with irony, even wit. So we learn that while Tamerlane’s troops constructed 120 towers of severed heads around the city from the 90,000 Baghdadis, mostly Muslims, whom he had slain, this 14th-century conqueror prayed at a Muslim shrine in the east of the flattened capital. Later, the awful fate of British prisoners captured at Kut in 1916 and sent on a forced desert march from Baghdad to Syria is described with rollicking alliteration that Anglo-Saxon readers cannot fail to appreciate. The hapless Brits, we learn, were “bullied, beaten, burgled and buggered”. The tone shifts again, suddenly stripped and informative, to describe Saddam Hussein’s industrial system of torture, where professionally-trained torturers maintained order through a perpetual Inquisition using hooks, acid, electric shocks, saws, and skewers. Women were raped in front of their husbands and parents forced to watch their naked children trapped in cells with upturned beehives. The US-led invasion may have been a disaster, but anyone still advocating Saddam as a viable alternative for Iraq needs to read Marozzi’s description of Saddam’s tenure just to be reminded at what price Baathist “order” came. Marozzi knows his subject too well to cast his city in the tragic role of victim. Ultimately, rather than be appalled at its fate, the reader can only but admire the resilience of its inhabitants, and the obstinate refusal of hope to be smothered in Baghdad’s current guise as City of Blood.